Just a few minutes after I published my post about writing blog posts while offline I received an email from someone needing assistance using Google Drive offline. Below you will find written directions along with screenshots for enabling offline use of Google Documents on your laptop. 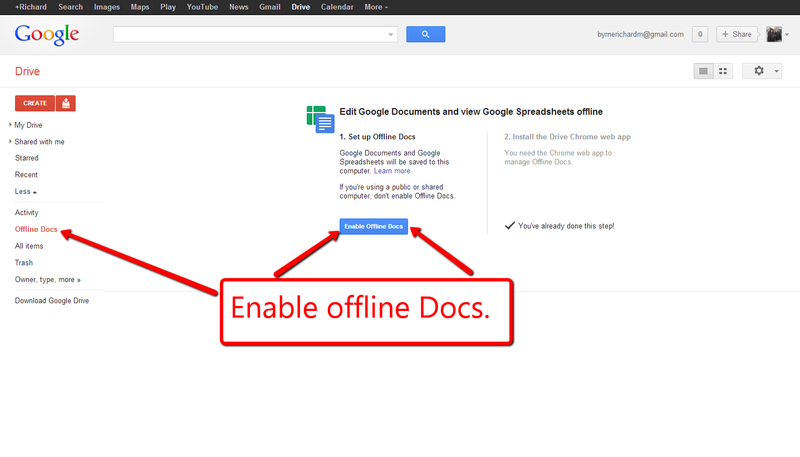 To enable Google Docs for offline use, sign into your account and click the sprocket icon in the upper-right corner. Then select "set up docs offline." 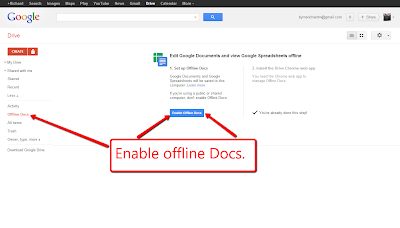 Google Docs will then launch a dialogue box asking you to confirm that you want to enable docs offline. If already have Google Drive installed, you're finished with the set up. If you don't have Google Drive installed, you will be prompted to do so. If you need help setting up Google Drive on your Mac or on your PC, please see the directions that I have included in my guide to Google Drive and Docs for Teachers (page 7 has directions for Mac users, page 14 has directions for Windows users). Step 1: In your Google Drive account open the "more" menu. Step 2: Select "enable offline docs." If you don't have the Google Drive Chrome app already installed, you'll be prompted to do that too. Installing the Chrome app takes just one click. If you are using Google Docs within a Google Apps for Education domain your domain administrator will have to enable the option for users to use Google Docs offline. Google's directions for domain administrators can be found here. A screen capture of the Apps Domain settings is included below.